This photograph, coupled with the Saucier Family photograph in the May 1st post ought to provide enough clues to help date the latter. To arrive at that destination, we’re going to take a stroll through the women’s department. You men out there? Just carry your lady love’s handbag proudly, and bear with me for a few minutes. 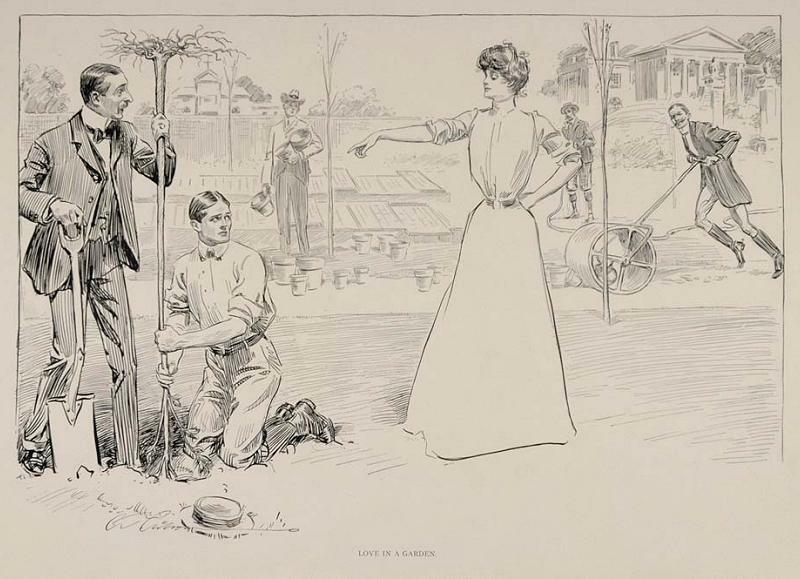 A little bit of background: Charles Dana Gibson was an American artist who realized fame and fortune for a series of pen and ink illustrations satirizing the relationships between men and women. The women in his artwork personified “a composite of thousands of American girls,” and he portrayed the women dressed in the current fashions. 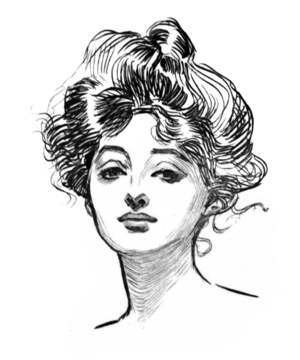 For thirty years, Gibson’s work regularly appeared in Life, Harper’s Weekly, Scribner’s, and Collier’s, and the illustrations became so iconic that the style of the era was named for him – The Gibson Girl. First Stop: The Beauty Salon During the Gibson Girl period, a woman’s hair was her crowning glory, and putting your hair up was still considered a rite of passage – a young girl did not put her hair up until she was considered old enough to go out into society. The typical Gibson Girl wore her hair piled high on her head in a loose pompadour style. Second Stop: Lingerie The S-shaped, or “kangaroo” corset was in vogue. Nipped waists decidedly got a thumbs up. Busks, bustles, and crinolines… nix. The natural silhouette – and I use that term loosely – was finding favor, but in the 1900-1910 era, that look was still a few years off. We have the hairstyle, and we have the form to hang clothes on, so let’s slide on past the After Six department in our search for daytime fashions. Final Stop: Ladies Dresses Frills, flounces, and furbelows were fading into the background while the tailored look took a giant step forward. An A-line skirt was the order of the day, worn with a shirtwaist that often sported a high-necked collar. 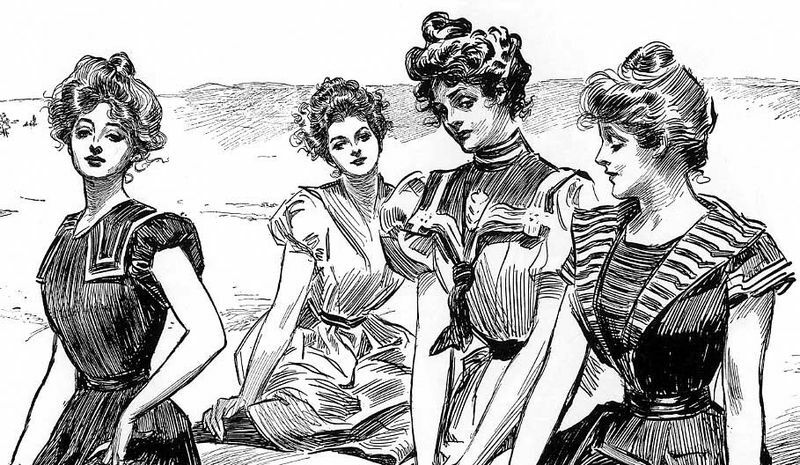 In the Saucier Family photograph, I count six shirtwaists in the top row alone, all with high-necked collars – and please note, every woman is wearing her hair up in the Gibson Girl style. 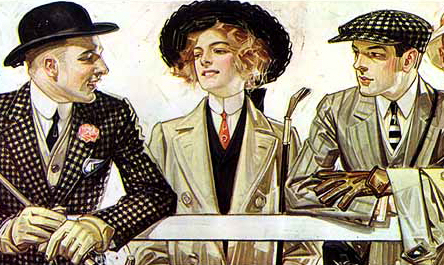 The following illustration for Arrow Shirts: 1907, was a lucky find. I stumbled across it while doing some homework on the Gibson Girl, and it stopped me in my tracks. Take another gander at the photograph above – the young woman on the far right – she’s wearing a tall, stiff collar and a narrow necktie in the manner of menswear. Then, as now, fashion houses often based their designs on what was seen on city streets, so it really doesn’t surprise me in the least to see this advertisement dated 1907, especially during a period of conservative fashion. I’ve extracted James G. from both photographs. If we assume that the photo on the left was taken about 1902-03, James would have been fifteen or sixteen years old at the time. Looks about right – so far, so good. I’ve also extracted two more “knowns” – Mabel (b. 18 March 1899) and Eugene Field (b. 21 August 1894). In 1902-03, Aunt Mabel would have been three or four years old, and Uncle Gene would have been eight or nine (still in short pants!). Taking a second look, Mabel might be as young as two, and Gene as young seven, but no younger than that – so I think 1901 is a viable possibility. I would not, however, place the photograph any later than 1903. Which brings me back to the reason I’ve started this conversation… who were those extra women in the Saucier Family photograph? I’ve provided a little more information for you to chew on, but for now, the ball is back in your court. This entry was posted in FAMILY and tagged Mysteries, Photography, Sleuthing, TOGS on May 5, 2013 by Jo. I enjoyed this post very much. I have a photo of Josephine Saucier (sister of James G.) wearing what looks like a man’s business suit jacket. I dated the photo at about 1910 based on the shoes she is wearing. She is out hunting so I thought maybe she borrowed a worn-out man’s jacket so as not to mess up her dress. The jacket seemed like an anachronism, but now I see from the color illustration near the end of your post that it was a style for women. So glad you enjoyed the post, and I’m especially happy that you got something out of it that helped in your own sleuthing! Would love to see the photo of Josephine.